Greeting cards might be petite, but they are essential to mark all the important occasions in one's life. They act as a mouthpiece when showing feelings is concerned. They are the best gestures of love, care, affection, respect and numerous other emotions. Even so, why does one need to spend so much money on the cards when one can design it easily? Everyone used to design cards as children but the habit fades away with time. With Greeting Card Studio, greeting card maker software, you can bring back the creativity and design your own cards. A greeting card is a gesture which is more liked as compared to expensive gifts. It portrays your feelings very well without you having to say anything verbally. With this greeting card creation software, you can design attractive greeting cards for all occasions. Now-a-days online cards are a rage and everyone likes to send one to relatives and dear ones. You can effortlessly design a card using this greeting card making software from Greeting Card Studio. However, you don't have to worry if you believe in giving a printed card to your near and dear ones. You can easily print cards too created using this software. There are many advantages of designing an e-card. You can send them to anyone, around any corner of the world, at whatever time you feel like. They are cost-effective and easy to send to anyone and almost anywhere. 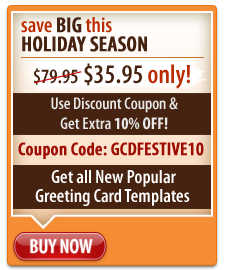 The huge popularity of e-cards is another reason to get hold of this amazing card making software. You can design attractive cards using this card making program within minutes. With the help of this greeting card maker, you can get customizable cards too using pre-made card templates. The simple reason for the same is that it has ready-made card templates for you to choose from. You do not need to design a card from scratch, and you are spared all the effort. You are just required to pick your favorite card template and with a bit of editing, you can get beautiful cards. To customize your greeting card, you can add your images to it and personalize it. You can add various shapes and callouts to add a personal message too. With the help of Greeting Card Studio software, you can access pre-designed backgrounds and borders to beautify your card. You can also choose from over 4000 graphics and symbols. With the easy-to-use intuitive card creating interface of this software, you can create amazing card designs with no effort at all. Not only this, it gives you a variety of folding methods too like half folded, quarter folded, accordion style, etc. Once you start using this card maker software, creating cards will be fun and pleasurable!